All stainless steel service saddle for HDPE pipe. 305-H service saddles use spring washers to help compensate for pipe contraction during temperature and pressure changes. 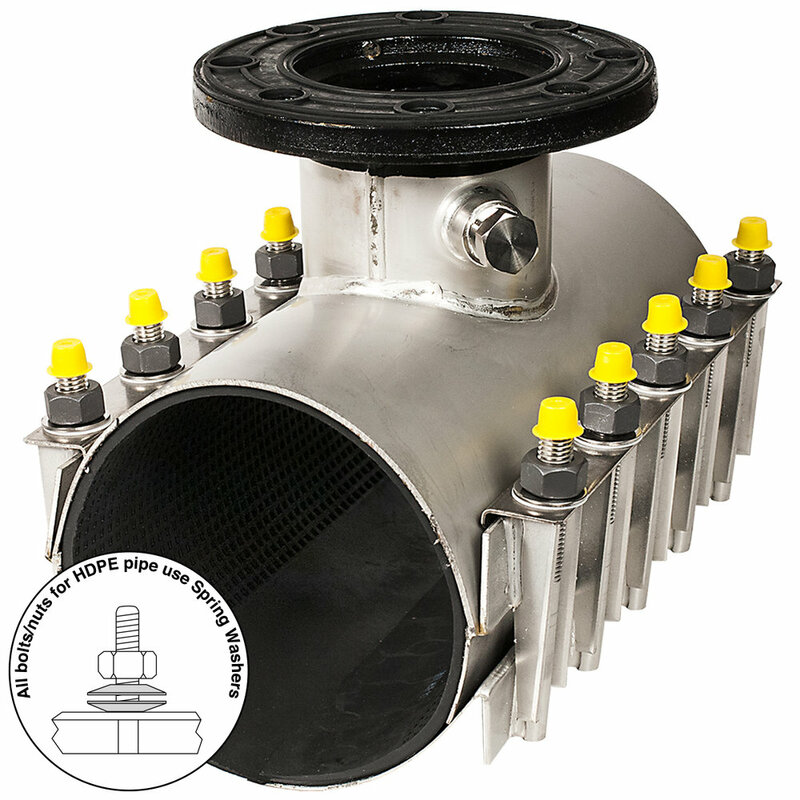 OUTLET SIZES 3/4" - 3"
COMPATIBILITY For use on HDPE pipe with a minimum wall thickness of SDR26. WORKING PRESSURE pressure rating of the pipe up to 150 psi. OUTLET 304 Stainless Steel half coupling fused to pad with GMAW welding. 3/4" through 2" IP and CC. ALL threads meet AWWA C800. 305 saddle outlets can be larger on request. SHELL 304 Stainless Steel, gauges ranging from 24 ga. for smaller pipe O.D.s to 18 ga. for larger pipe O.D.s. SIDEBARS Heavy gauge 304 Stainless Steel, GTAW welded to form permanent fusion with shell. LUGS 304 Stainless Steel, fused to sidebars by GMAW welding. BOLTS 304 Stainless Steel, 1/2" or 5/8" rolled thread. Bolts are MIG welded to sidebar. NUTS 304 Stainless Steel, 1/2" or 5/8" UNC thread. Nuts coated to prevent galling. GASKET Gasket is made from Nitrile Butadiene Rubber (NBR) compounded for water and sewer service and a tolerance of petroleum products in accordance with ASTM D 2000 MBC 610. Other compounds available for special applications.